“Dear friends welcome to another tutorial! In this tutorial we are going to build aWiFi enabled weather station project! We are going to use the new, impressive ESP32 chip for the first time along with a Nextion display. In this video, we are going to make this. 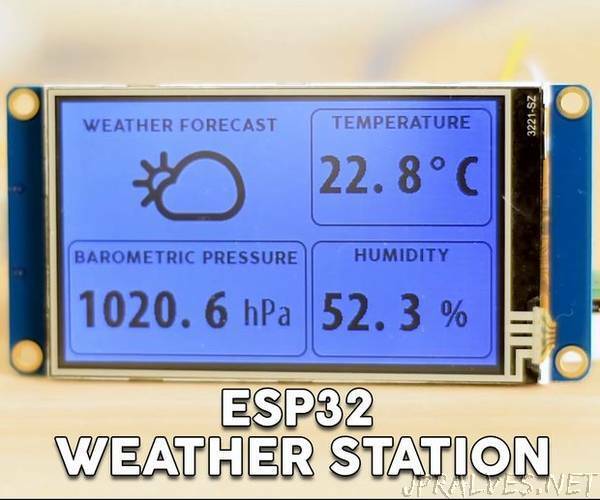 It is yet another weather station project I know, but this time we use the new ESP32 chip! We also use the new BME280 sensor which measures the temperature, the humidity, and the barometric pressure. When we power up the project, it connects to the WiFi network, and it is going to retrieve the weather forecast for my location from the openweathermap website. Then it will display the forecast on this 3.2 Nextion Touch Display along with the readings from the sensor! The readings are updated every two seconds and the weather forecast every hour! As you can see, in this project we use the latest technologies available to a maker today! If you are a DIY veteran, you can build this project in five minutes. If you are a beginner, you have to watch a couple of videos before attempting this project. You can find links to these video in this Instructable, don’t worry.